We’re officially two weeks removed from Duke’s fourth national championship, and already we’ve received good news about the 2010-2011 Blue Devils: Kyle Singler is coming back for his senior season. This post was supposed to be about Kyle’s brilliant performance in the NCAA tournament (save the Baylor game), but we decided to delay it until he made his decision on the NBA. Now that he has made it, we are undoubtedly (and selfishly) happy that he made the choice that he did. By averaging 20 points and 9 rebounds in the Final Four, Kyle Singler was named the Most Outstanding Player of the NCAA’s final weekend. Furthermore, Singler played sound defense on West Virginia’s DaSean Butler (10 points, 2-8 shooting) and Butler’s Gordon Hayward (12 points, 2-11 shooting) in the Final Four. He displayed a polished offensive game with an array of three-pointers, floaters and tough layups in traffic along with his consistent intensity on defense and loose balls. Kyle Singler is both one of the most talented and one of the toughest players to ever put on the Duke uniform. His father, Ed, when discussing Kyle’s draft prospects, said, “[NBA scouts] are not even questioning his heart or character or work ethic and skill level, those are pretty evident when seeing Kyle play.” The injuries from Singler’s tough play have become almost legendary: the elbow he ate from Andre Dawkins in a practice before the Sweet 16 game against Purdue that required stitches; the black eye that he played with in February victories over Miami and Virginia Tech; and who could forget, his dive into ESPN announcer Dan Shulman during the ACC tournament that gave Dickie V sole possession of the broadcast for a whole two minutes. All cliches aside, he really does wear his playing scars like badges of honor. GoDuke notes that Singler has scored the third most points ever (1767) in Duke history through his junior season. Only two of the greatest Blue Devils of all-time, Jason Williams (2079) and JJ Redick (1805) scored more points before their senior season. Singler could conceivably be the third leading scorer in Duke history by this time next year, a spot currently held by Christian Laettner (2460). Regardless of what he accomplishes next season, Kyle Singler already has one ring, something not even the two highest scorers (Redick and Johnny Dawkins) in Duke history can boast of. We’re not here to speculate whether Kyle would have been a first-round lock or a possible second-rounder if he declared; we’re also not here to speculate what his draft stock might become. We’re here to appreciate the fact that two of our starters, two of the guys that made up the Big Three, are returning. Next year’s team will undoubtedly be captained by Singler and Nolan Smith. Singler was the No. 6 recruit in a 2007 class whose top 5 recruits were lottery picks in 2008 (remember Kyle’s Oregonian rivalry with Kevin Love?). Whereas those five were all one-and-done, staying all four years speaks volumes about Kyle’s love of college life and his wish to leave a stellar legacy at Duke. It says nothing about his ability to play in the NBA—he will be an NBA player (a damn good one at that). Leave the conjecture about Kyle’s NBA future alone; just appreciate that #12 will be back in Cameron for one more ride. Before we discuss Duke’s incredible run to the National Championship this past weekend, let’s rewind a month to March 6th. Moments after defeating rival UNC 82-50, seniors Jon Scheyer, Lance Thomas, Brian Zoubek and fifth year player Jordan Davidson held court in front of a rabid audience of Cameron Crazies. Donning the fresh ’17-0′ t-shirts designed by Kyle Singler, our seniors recounted favorite memories from their illustrious Duke careers. Lance and Zoubek highlighted the ACC championship last season, and Davidson spoke of how fortunate he was to be on this team at all. Jon Scheyer, however, took a different approach in his brief speech—he said his best moment was still to come. Would it be the 2010 ACC Tournament? Beating a fantastic Baylor team to reach the Final Four? Making it to the National Title game? None of these. The Duke Blue Devils won the 2010 National Championship in a thrilling game over Butler—the best final game since Kansas-Memphis ’08 and perhaps one of the most exciting and nerve-wracking championship games of all time. Jon Scheyer’s best moment—and indeed, the best moment for each player on this special team—came on the latest possible date of his career: April 5th, 2010. Almost precisely a month after the victory over UNC. It was indeed a banner year for Duke. Some of the statistics don’t appear on paper, but they are staggering: 31-0 in our home white jerseys, 35 victories overall and the trophy from every tournament we entered. We took home the Preseason NIT (UNC almost won the actual thing! Almost. ), the ACC regular season and tournament crown, the South Regional championship, and the hardwood plank of the National Championship. Jon Scheyer is one of the greatest Blue Devils of all time. Scheyer finished his career in the only appropriate manner—with a national title. His 15 points against Butler gave him 2,077 for his career, putting him at ninth all-time at Duke behind Jason Williams and Gene Banks, who each scored 2,079 points. We have lauded Jon all year on this website. He is the consummate leader by example, doing everything the coaching staff asks of him and quietly exuding the Duke way. In his career, he has been magnificent against UNC in both winning and losing efforts. Jon’s 2009 transition from shooting guard to point guard was so seamless and successful that he was a finalist for the prestigious Bob Cousy Award this season, which honors the nation’s best floor general. Somehow Greivis Vasquez took home that honor over Scheyer (and John Wall and Sherron Collins…). Nonetheless, Jon got the ultimate prize: the National Title, and in his senior season to boot. It’s been quite a ride for Scheyer, who has factored in K’s strategy from the first. Four years after taking a shot to the face from VCU’s Eric Maynor in the NCAA first round, Jonny gets the last laugh over all his detractors. We wish him luck moving forward from this pinnacle of basketball accomplishment. If his nearly flawless leadership, perfect jumper and proclivity to protect the pill doesn’t earn him a bench position on an NBA team, there is something wrong with American pro basketball. this championship without these two senior big men. LT and Z bore the brunt of extreme criticism from Duke fans over their first four years, and many predicted that Miles and Mason would bump them from the starting rotation this season. For the first few weeks of the season, these two still looked lost on the offensive end. But in the past semester, something clicked. We won this championship with rebounding and defense, and Lance and Brian were key in making those statistics the fundamentals of Duke’s success. Zoubek particularly has emerged and become the nation’s best offensive rebounder. His final rebound of Gordon Hayward’s miss was fitting—how else could his career have concluded? Thomas’ contributions this season have also been invaluable. As our best on-ball defender, LT has guarded future pros like Stanley Robinson, Craig Brackins, Ekpe Udoh and Devin Ebanks this season. A few of his plays have been absolutely crucial: his tip dunk and-one against Baylor (pictured at right) was particularly memorable. Unlike Scheyer, Lance and Brian haven’t always been a crucial part of Duke’s gameplan. But this year, when our frontcourt had to step up to support the 3 S’s, these two men answered the call. Without the toughness, selflessness and desire of Brian and Lance, Duke would have stopped dancing long before Indianapolis. It’s nice to win the right way, isn’t it? How cathartic, as true basketball fans, was it to watch two honorable programs play for the national title? In a year where powerful but troubled programs like Kansas and Kentucky were favored to take the championship, it seems like a dose of karma that Duke and Butler—two squeaky clean programs led by no nonsense coaches—were on the game’s biggest stage in April. I don’t want to delve into the nitty gritty details about why those other programs are corrupt (although The Onion did a nice job with Kentucky). But Duke and Butler represented the Platonic ideal of college basketball: two programs that develop players over four years, play team basketball within a system, and think of their teammates as much as they think of themselves. We cannot say enough about the grit and fortitude of the Butler Bulldogs, particularly the unflappable Gordon Hayward. We won the game, but Butler proved that hard work and persistence are just as important as flashy dunks and 5-star recruits. championships come in twos. Although ‘predictions’ about next season are largely unimportant, the Blue Devils will absolutely factor in the title hunt next year. Returning Nolan Smith is a definite, and we await Final Four M.O.P. Kyle Singler’s verdict on his future. The Plumlees will be back, as will Andre Dawkins and Ryan Kelly. Seth Curry sheds the redshirt next season and he may be the most surprising player of all. Nolan said that one major factor in his incredible improvement this season has been playing against Seth in practice. With a year of practice under his belt, I think that he will be ready to contribute right away, and earn starter’s minutes after Christmas. There’s also no need to belabor our excitement for next season’s incoming recruits: Kyrie Irving, Josh Hairston and Tyler Thornton were an excellent class even before Carrick Felix committed several weeks ago. Smith, Irving, Curry, Dawkins and Thornton on paper look like Duke’s best backcourt in a decade; it will be up to the Plumtrees, Kelly and Hairston to provide enough bulk down low to keep the Duke train rolling full steam ahead. 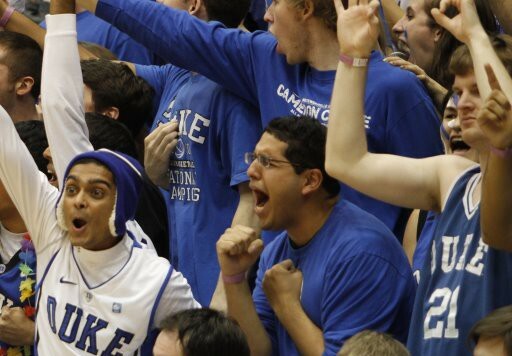 But lest we get too excited about next year…here’s Duke’s One Shining Moment. We will never forget this team, this season and the incredible run to a fourth National Title.